Isaac Rosenberg was born to Jewish Lithuania parents in 1890 and is now well-known as a gifted war poet of World War 1. His most famous poem is probably ‘Break of Day in the Trenches’ which he wrote in 1916. 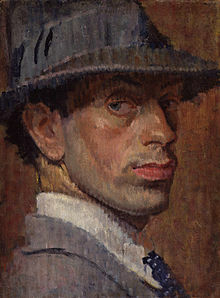 He left school at fourteen to be apprenticed to an engraver but later joined the Slade School where he was contemporary to some of the great painters of the early twentieth century, including Stanley Spencer, Dora Carrington and Paul Nash. He suffered from ill health, in particular bronchitis and moved for a while to South Africa however although he had been critical of the war from the beginning, in 1915 he returned to England, joined up and was sent to the Somme. He was killed on April 1st, 1918… he was twenty-eight. How great a poet he may have become had he survived. What I didn’t realise was that he was actually born in Bristol, which is the biggest city near to us, only twenty or so miles away. He is recorded on the census there in 1891, with his parents Barnad (or Barnett, or Barned) who was born in Kovno, Russian Poland in 1857, and his mother Anne, who was born in Dinaburg in Russia in 1861. Kovno is now in Lithuania and gained notoriety during the second word war as a ghetto for Lithuanian Jews who were then sent to concentration and extermination camps… Dinaburg, now Daugavpils is in Latvia and is the second largest city after Riga. In 1891, however, baby Isaac was a Bristol baby, born there in 1890 and living with his Latvian born sister Minnie aged nine, and his parents They lived at 5, Upper Adelaide Place, which apparently still exists! I will investigate next time we go to Bristol although the city was so badly bombed during the second war that little remains of the original. Isaac’s father was a drapery dealer… which could mean many things but I tend to think more the rag-and-bone end of the scale! By 1901 the family were living in 58 Jubilee Street in Stepney, London; Isaac and Minnie had siblings, Annie eight, Rachel aged six, David aged four, and little Elkan aged two The family must have moved to London between 1897 and 1899 because the elder boy was born in Bristol, the younger in London. Minnie helped her father in his business. Living close by were neighbours, another family of Rosenbergs, Nathan and his wife Miley, and their children, Lewis, Bika, Joseph and Golda…. relations maybe? They came from the same area! In 1911 the family had moved again but were still all living together this time at 159 Oxford street, Mile End. Minnie was now working in fancy stationary for R. Jucks and Sons, Annie was a clerk working for Steel Seals Manufacturers, Rachel worked making underwear in a drapery store, and the two younger boys were still at school. Isaac was a painter. Minnie moved to South Africa sometime after this and Isaac went to join her because of his ill-health but as I mentioned above, he returned to serve and die for his country.